In this tutorial I will explain how to automatically send DM to new Twitter followers. You will be able to specify the message that should be sent as DM whenever someone follows you on Twitter. For this, I will use a tool called CrowdFire. 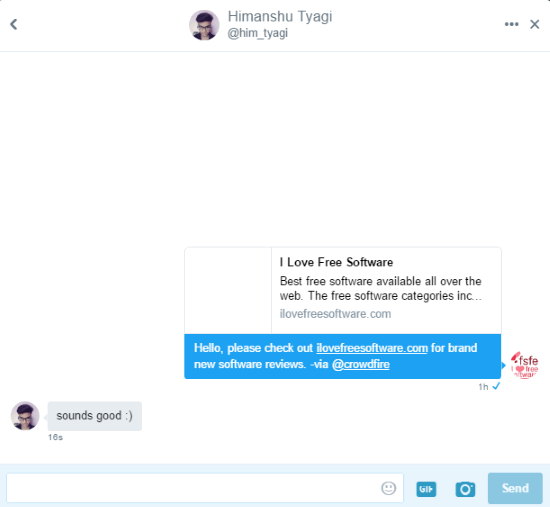 CrowdFire is a free website to send Twitter auto DM to new followers. It will let you specify an automated message that will be sent to your new Twitter followers. After that, it will automatically send the specified message to your new followers, as shown in the screenshot below. Do note that it will add “via @crowdfire” after every automated DM in the free plan. So, if it’s OK for you then you can go ahead and use it to send auto DM to your new followers. In addition to this, you can also use it to see non-followers, inactive followers, all following, etc. Also See: Download photos from any Twitter account from the command line, How to change the background of Twitter website in Chrome. In case, you want to automate WhatsApp replies, you can check out this tutorial written by us which explains a method to send auto replies to WhatsApp messages at a specific time. In order to use Crowdfire, you have to create an account; visit the link at the end of this review to create a free account. 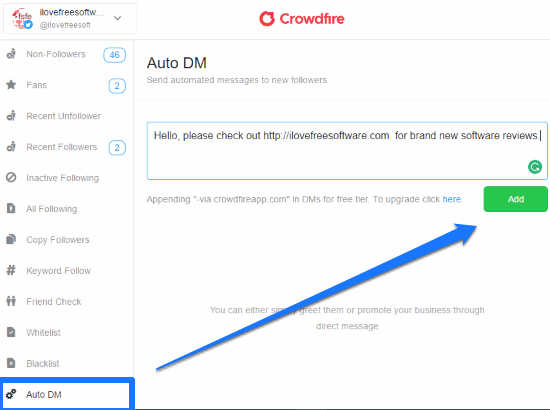 After that, you can connect your Twitter account with Crowdfire and specify a message to be sent as a Direct Message to every new user who follows your Twitter account. However, it doesn’t support variables to be declared in the DM. That feature could have allowed us to personalize DM that is sent to new followers. If this functionality is added in the near future then it will surely enhance its usability and allow users to send more personalized DMs to their new followers. Step 1: After you have created an account on CrowdFire, you will see its interface, as shown in the screenshot below. Its bot on the main screen will help you to get started and connect your Twitter and other social media accounts. You can also connect your Twitter handle from the “Accounts” option on the top-left. 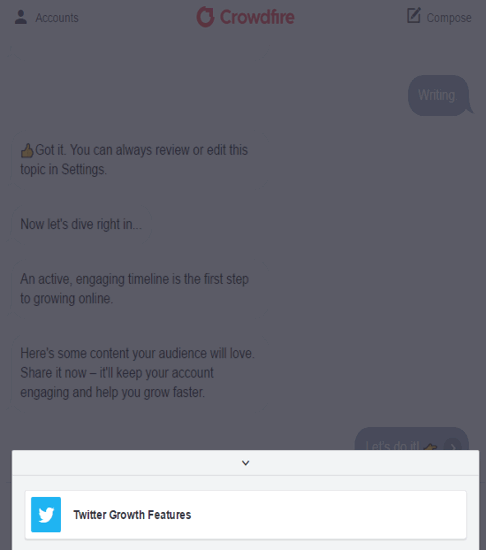 Once you have connected your Twitter handle, click on the bottom-left menu and select “Twitter Growth Features” option, as displayed below. Step 2: Now, you will see various Twitter options to see non-followers, recent followers, inactive following, etc. and the one you are most interested in i.e. “Auto DM”. Switch to the “Auto DM” option and you will see its interface to specify the DM to be sent automatically to new followers. You can write the automated message in the large text area and then click on the “Add” button to save it, as shown in the screenshot above. That’s all you have to do to send automated direct messages to new Twitter followers of your handle. If you want to stop the “Auto DM” service, then simply delete the saved message. It is debatable if sending auto DM to new Twitter followers is a good idea. Some people and companies like to do it, and use that to share information about their website, social media handles, etc. If you also fall in that category, then CrowdFire gives an easy option to automatically send DM to new Twitter followers. Only downside of the free plan is that it will add “via @crowdfire” in each DM. If you don’t want that, then you might be better off manually sending the greeting to new followers, and also personalize the message to initiate the conversation.